In conjunction with the Pro Light + Sound Show, Yamaha Corporation Japan has announced the release of the new PX Series of versatile power amplifiers that meet the requirements of a vast range of sound reinforcement and installation environments. By combining high power output with intelligent signal processing and a lightweight, yet durable design, the new models are able to deliver consistent, clear, high-quality sound even at maximum output levels. 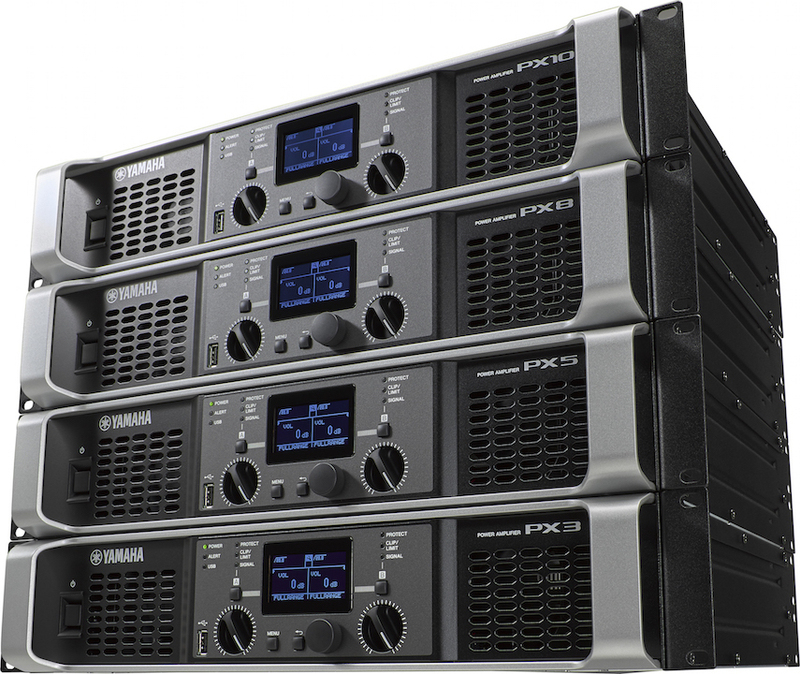 The PX Series comprises four new models: PX10 1200w x 2, PX8 1050w x 2, PX5 800 w x 2, and the PX3 500w x 2, and come equipped with both XLR and TRS inputs, and binding post, SpeakON and phone outputs for a flexible range of connectivity. All models are driven by a newly-developed Class-D amplifier engine that concentrates all necessary DSP functions into a single custom LSI chip, offering higher output and improved performance in a more lightweight, yet reliable design. The PX3 and PX5 also come equipped with a Power Boost Mode that combines the power output from two channels into one, achieving significantly higher single-channel power levels to drive high power handling speakers when needed (note: the number of channels available is halved in this case). Each of the new amplifiers come equipped with flexible onboard PEQ, crossover, filters, delay, and limiter functions that can be set quickly and easily via the LCD display. All models feature intelligent protection functions for safe reliable operation, as well as Yamaha-developed D-CONTOUR multi-band dynamic processing technology, to deliver consistent clarity and high-quality sound at any output level by tailoring the frequency response of each connected speaker for either front-of-house or monitor configurations. 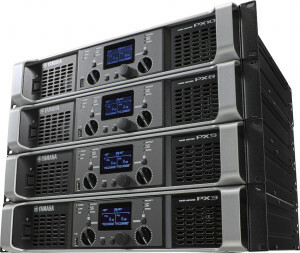 PX Series amplifiers also offer both Basic and Advanced setup modes. Basic Mode enables inexperienced users to easily configure a system that meets their needs, while Advanced Mode offers experienced users more precise control of their sound. All four models feature eight programmable presets for instant recall and reduced setup time that can be saved to a USB thumb drive and quickly shared with other PX amplifiers. The Config Wizard allows end users to save even more time during system setup by assigning optimized speaker settings that match various system configurations. Config Wizard features presets specifically tuned for each model in the extensive Yamaha lineup of passive speakers, including the CBR, Club, Installation, and VXS/VXC series, and an advanced mode that allows more detailed configuration of parameters such as input routing, input sensitivity, amp gain, and speaker impedance. PX Series amplifiers make it fast and easy to configure panel settings, monitor amplifier status, transfer data via USB, and also feature a panel locking function to keep settings safe. Users can even export information such as an internal device and log data to a USB drive for rapid troubleshooting. The PX Series will be available in June 2016.